Jaipur: India off-spinner Ravichandran Ashwin shocked almost everyone by running out England's Jos Buttler by the means infamously known as 'Mankading' in the Rajasthan Royals (RR) versus Kings XI Punjab's (KXIP ) match in the 12th edition of the Indian Premier League (IPL) here on Monday. 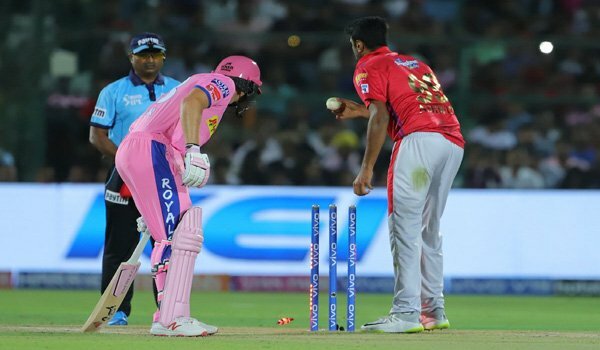 KXIP skipper Ashwin, who was bowling in the 13th over, saw Buttler, who was going good (68 off 42 balls), walking out of his crease even before the ball was released and the bowler stopped to take the bails off. The field umpire referred the decision to the third umpire who was given the batsman out. A heated debate was seen between Buttler and Ashwin. This is the first time a player is out in this fashion in the IPL. Reacting on this, in the post-match presentation, Ashwin said, "No argument to that (run out), it was pretty instinctive. I didn't even load and he (Buttler) left the crease. It has always been my take on it, because it's my half of the crease. We ended on the right side of it but those things are game-changers and batsmen need to be wary of it." "I don't understand where the spirit of the play comes in this," KXIP skipper added.Ashwin drew a mix reaction over the run out. Australia's legendary leg-break bowler Shane Warne took to twitter to express his disappointment over the run out. "So disappointed in @ashwinravi99 as a Captain & as a person. All captains sign the #IPL wall & agree to play in the spirit of the game. RA had no intention of delivering the ball - so it should have been called a dead ball. Over to u BCCI - this a not a good look for the IPL," Warne tweetd.